Eastern junior Caterina Miecchi (18) spikes the ball between Lady Rebels Christine Griffith (25) and Amaya Howell (2), during the Lady Eagles triumph on Thursday in Tuppers Plains, Ohio. TUPPERS PLAINS, Ohio — No ring rust here. 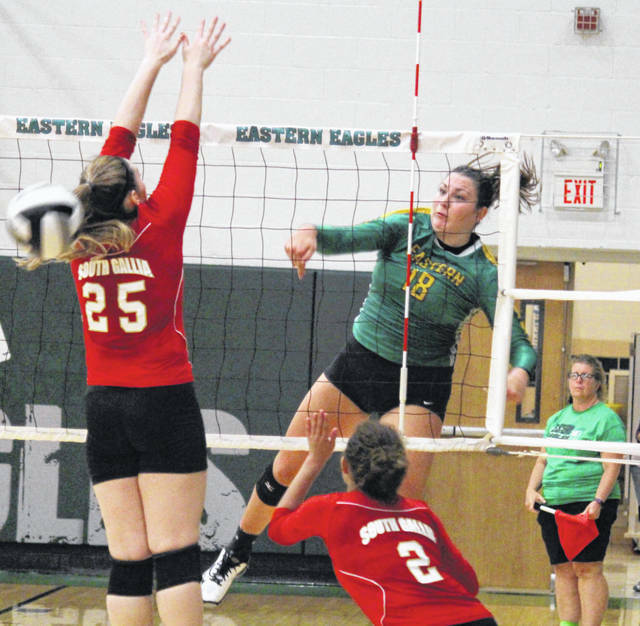 The Eastern volleyball team played its first match in a week and just its second of the month on Thursday at ‘The Nest’, but that didn’t stop the Lady Eagles from picking up a straight games victory over Tri-Valley Conference Hocking Division guest South Gallia. Eastern (5-1, 4-0 TVC Hocking) never trailed in the opening game, but South Gallia (4-6, 2-3) stayed within five points the entire time and ultimately fell by a 25-21 count. The Lady Eagles led wire-to-wire in the second game, taking the 25-11 win to move ahead 2-0 in the match. 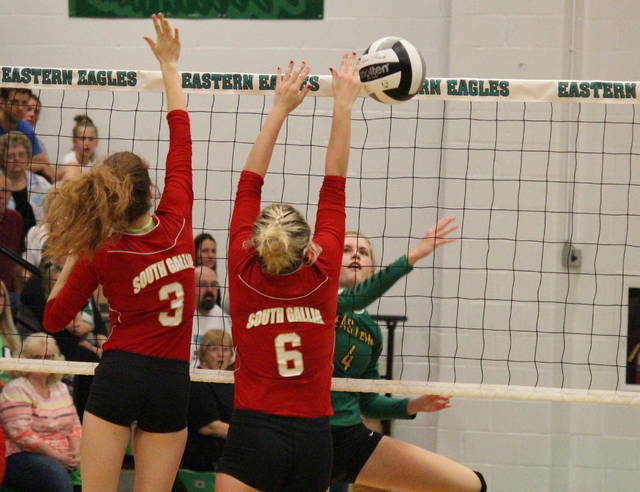 South Gallia claimed its first and only lead of the night at 1-0 in the third game, but Eastern took the advantage at 2-1 and never relinquished it on the way to a 25-11 match-clinching victory. 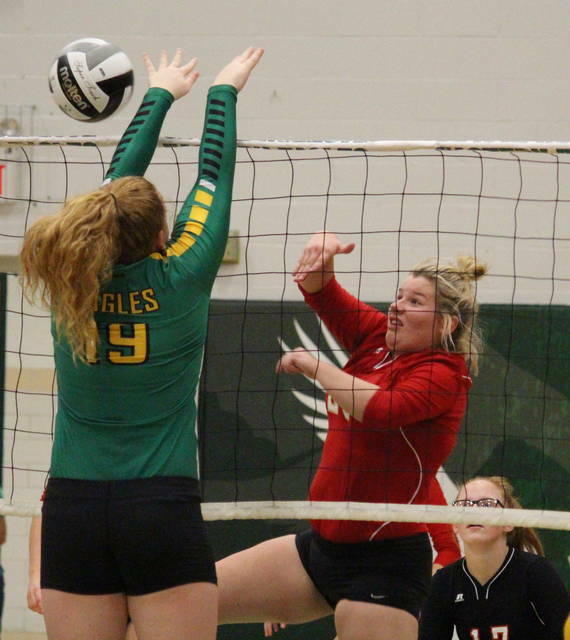 As a team the Lady Eagles had a serve percentage of 89.2, with 17 aces, while South Gallia had a trio of aces and a serve percentage of 88.4. Eastern earned a side-out percentage of 65.1, while the Lady Rebels finished with a 36.5 side-out parentage. 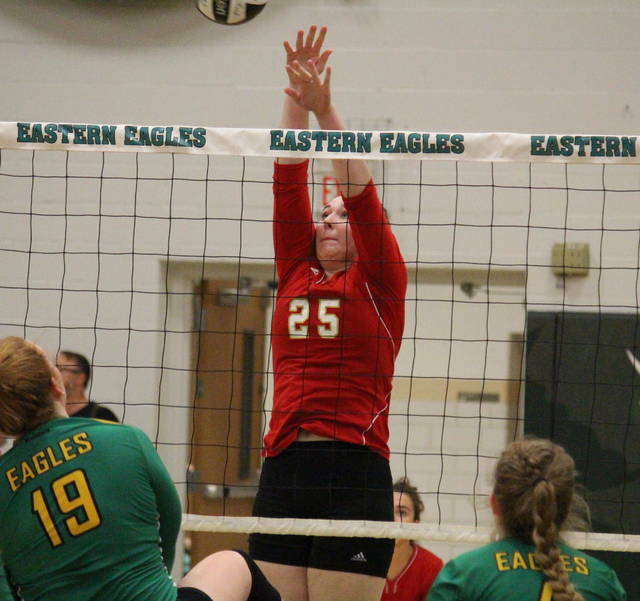 Kelsey Casto led the Lady Eagle service with 20 points, including five aces. Jenna Chadwell had eight points and a pair of aces, Caterina Miecchi added six points and four aces, while Allison Barber recorded five points and one ace. Sydney Sanders had four points and three aces in the triumph, while Haley Burton and Kylie Gheen both earned two points and an ace. SGHS was led by Rachal Colburn with four points, including one ace. Isabella Cochran and Makayla Waugh both had three points, with Cochran earning a pair of aces. Christine Griffith had two points in the setback, while Amaya Howell and Faith Poling had a point apiece. Miecchi led the hosts at the net with eight kills and one block. Allison Barber posted six kills in the triumph, while Layna Catlett had four kills and two blocks. Olivia Barber finished with two kills and one block, Gheen added a pair of kills, while Chadwell ended with one kill. Chadwell and Burton tied for a team-best with 14 assists apiece, while Sanders had a nine of the team’s 27 digs. Colburn led South Gallia at the net with four kills and a block. Waugh, Poling and Griffith each finished with one kill for the guests. Colburn led the Lady Rebel passing, while Amaya Howell was the team’s lead ball-handler. These teams will meet again on Oct. 4 in Mercerville. South Gallia will be back at home on Monday against Federal Hocking. The Lady Eagles are scheduled to visit Wahama on Monday.